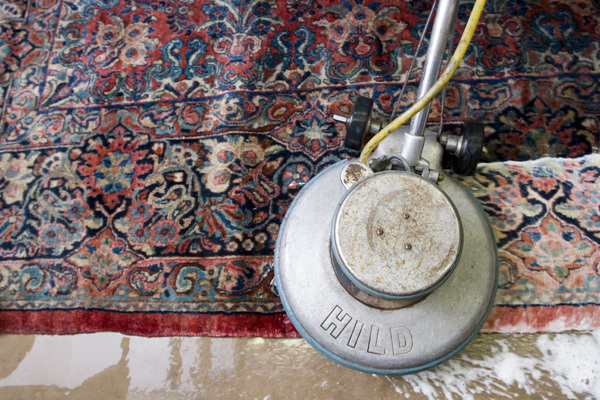 Isberian Rug Company has Colorado's only state-of-the-art cleaning facility. Our cleaning process is 100% hypoallergenic, biodegradable, and safe for your children and pets. All of our rug services are done in-house at our store in Basalt, Co. which allows us to monitor the quality control throughout the entire cleaning process. You can trust your rugs to the experts at Isberian Rug Company because we can identify the origin, age, fibers, dyes, weaves and type of every rug that comes in for service. It is critical that you have an extensive knowledge of rugs in order to know how to clean them correctly. At the Isberian Rug Company cleaning facility, we begin our cleaning process by thoroughly dusting each rug to remove the dirt and grit that has settled to the foundation of the rug. We then wash the face and back of each rug by hand using a lanolin based, non-toxic, environmentally friendly shampoo. Each rug is rinsed thoroughly with fresh water, then hung to dry in our state-of-the-art dry room facility. Once completely dry, the rug is groomed by hand. During the finishing stage, we complete the final inspection of the rug, which includes a deep vacuuming, clipping of loose tufts, and combing the fringes and pile of the rug. The rug is returned to our customers wrapped in brown kraft paper to ensure it remains clean during transportation. We are also experts in stain removal, especially dog or cat accidents. Our natural enzyme solutions remove stains, disinfect, and remove odors from problem areas without causing harm to the rug or leaving behind residue or chemical odors. We also specialize in flood restoration and prevention of wool moth issues. Leaving your rugs to get very soiled can cause them to wear quickly and therefore shorten the longevity of the weaving. We recommend having your rugs cleaned at least once each year or more if needed. Pickup/delivery and installation services are available throughout the Roaring Fork and Vail Valleys. You can also drop your rugs off for cleaning at our stores in Aspen or Basalt, Co during business hours. Isberian Rug Company offers two rug washing specials per year. The specials run in the spring (April and May) and the fall (October and November). The cleaning price is discounted by 25-35% off the normal price. Know the difference between commercial carpet cleaners and Isberian Rug Co. The use of hot water or steam can be very harmful to rugs. Commercial cleaning operations which clean rugs in place at the home, often utilize toxic chemicals or a dry-cleaning process which does not clean the rug thoroughly and is harmful to the natural fibers of the rug. The dirt and grit in a rug will settle to the foundation of the rug over time. Therefore, cleaning a rug in place at a home means that only the very surface of the rug is being attended to and the real dirt within the rug is not being removed. The use of hot water or steam is also especially dangerous for rugs because it can cause color run, strip the natural properties from the rug, especially wool and silk rugs, or cause the rug to go out of shape or shrink. Contact us today with any questions or to schedule a pick-up & delivery appointment.